I've never owned a high-quality curling iron before. So, when the people at Flat Iron Experts wanted me to try out one of theirs, I was curious to find out if it was worth it to invest in a professional curling iron. 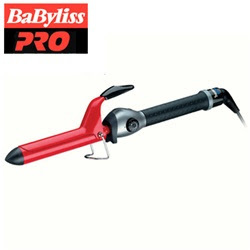 The BaByliss Pro Tourmaline Ceramic Curling Iron arrived in a really cute cloth bag tied with ribbon. I'm keeping the bag, so I can use it when traveling with the curling iron. The details that were put into making the curling iron were definitely impressive. The handle is very comfortable and rubbery. The place where you put your thumb is the perfect size so you won't burn your thumb (which I am notorious for doing). There's an on/off button, where all of my previously owned cheap curling iron were just on if plugged in, with this curling iron, you can turn it off while it's plugged in. I also like the fact that the cord swivels, so it doesn't get tangled or wrapped up as you twist your hair around the curling iron. Also, unlike my old cheap curling irons, this one's barrel is ceramic. That means the curling iron can heat to a higher temperature, retain that heat more efficiently, and distribute that heat more evenly. Also, ceramic barrels close the hair cuticle for a smoother, glossier look. With my older, cheaper curling irons, I would count to 15 to set each curl. With this curling iron, the curl was set after counting to 5. Is it worth the extra money? You'll have to decide that for yourself. For me, I think it is, just in the time savings alone, and right now, Flat Iron Experts have the curling iron listed at 30% off. Disclosure - I received a free curling iron to try in exchange for my honest opinion. No other compensation was received.